Situated on the mainland opposite Hong Kong Island we visit busy Kowloon for our second programme in the 2010 Hong Kong visit trilogy. Our filming starts in Kwun Tong at the Ferry Pier Bus Station at the end of the busy morning rush. There is a good variety of KMB buses with many of the white liveried air con Olympians and Dragons filmed returning from their duties. This is also a good place to see the fast dwindling numbers of non-air con vehicles, which will all be withdrawn by 2011/12. 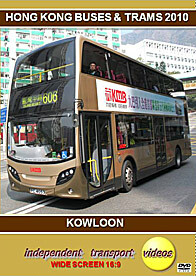 We also capture the action in Kwun Tong before taking a ride on a new KMB Enviro 400 – ATES1 (PC 4053) on route 606. This is the first new 2-axle double decker for KMB for many years. We film the bus travelling from Island Resort on Hong Kong Island at Siu Sai Wan to its destination at Choi Wan. From here we head to Kowloon Bay to film street action and at the busy Ferry Pier Bus Station. Mei Foo is our next location. This busy bus station and surrounding roads is served mostly by KMB, but both Citybus and New World First Bus vehicles are observed. Route 102 is the preserve of the latest vehicles from the KMB and Citybus fleets, the former with Wrights bodied Volvos, the latter with their latest Enviro 500s. Enjoy the variety and the sheer volume of buses seen operating. We then move to Lai Chi Kok Road for more action, again with KMB providing the variety. The Star Ferry Terminal at Tsim Sha Tsui is our next location. This busy bus terminal is soon to be redeveloped so scenes like these may not be repeated in future programmes. All the vehicles are from the KMB fleet, with non-air con Olympians and Dragons appearing as well as the latest Wrights Volvos. Also seen is one of the new Scania single deckers on driver familiarisation duties. We continue filming along the busy Salisbury Road and then on to the main artery road on Kowloon – Nathan Road where we see almost every type of KMB bus in action, together with NWFB and Citybus vehicles in large numbers. Filming continues at the new Jordan Bus Station located on To Wah Road. Our final day time filming location is Hung Hom Ferry Pier, a new location for our cameras as we witness the comings and goings of KMB and NWFB buses serving this ferry terminal. We close our visit to Kowloon in 2010 with a night time scene at Tsim Sha Tsui, full of atmosphere and bright coloured lights summing up this remarkable place which is home to so many interesting buses for you to enjoy!